Passion. It sparks in radiant arcs when you discover it—or it discovers you. When you possess it, you couldn’t hide its warm glow if you tried. Passion spills beyond the edges of your physical form to illuminate your true path in life. But to recognize that path you must wake up and pry your eyes away from the crowded route society suggests you travel, that road thick with business suit zombies—the working dead—who move wherever they’re told. To find your true path, you must study your surroundings, must discover where passion’s glow throws a vibrant light onto hidden doorways and seldom used short cuts. Trust and follow that beam. It will lead you to the person you were meant to be. But passion is not only luminescent; it’s magnetic as well. Passion draws kindred souls to you, even as it tugs you toward them. And when the individual light of passions mix and swirl in their infinite colors, magic emerges. Over the past few weeks, I’ve watched passion energized gatherings and witnessed how they connect us in the most unlikely places. For you pilots that read this blog, please read to the end to learn how your passions can help others with theirs. If you have a passion for flying like me, you were either at the AirVenture aviation show in Wisconsin the last week in July, or wishing you were. For seven days, enthusiasts from all over the globe spilled through the gates of Wittman Regional Airport in the tiny town of Oshkosh, all drawn by the love of aviation. On the grounds of Wittman, the world’s busiest airport for those seven days, people smiled, laughed, and socialized while surrounded by aviation. Typically, when thousands of people gather—in this case 500,000—you can’t help but witness rude acts by someone. But in the time I spent during the week, I can’t think of a single disturbing event that occurred in my presence. In fact, in the four years I’ve been, I can’t recall any rudeness at all. And in that worldwide fellowship at Oshkosh this year, I finally had the chance to meet some fellow aviation bloggers in person. Lynda Meeks, a citation jet pilot needed some help at her “Girls with Wings” booth at the show so I volunteered for a bit. Lynda is not only passionate about flying, but also about inspiring young girls to fly by providing role models for these young women to look up to. I was the “tattoo guy” in the booth, my responsibility to attract attendees our way, then “brand” them with a Girls with Wings tattoo. I’m pleased to say that only a few people graciously declined. While in the booth, I met Dave Gamble, blog author of the Papa Golf Chronicles. Dave was one of the first bloggers to list my blog on his when I first started. I met Dave because his daughter, nicknamed Egg, volunteered most of the week in the booth. Somehow, as I was busy talking to exhibit attendees, Egg peppered me with tattoos on my forearms and knee. I began to get a bit concerned I may not escape without one on my forehead. I think Egg tried a couple of times, but I ducked. The guys at the camp gave me some good natured ribbing over the tattoos I sported during our next hangar flying session. 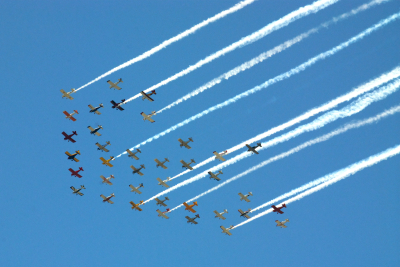 If you’re a pilot and haven’t ever been to AirVenture, you know not what you miss. In a single day you may have fellow aviation enthusiasts like Sir Richard Branson or Harrison Ford stroll past you. But for a real treat, fly yourself to Wittman next year and stop by Steve’s camp under the massive oaks next to the vintage area to introduce yourself. There are no strangers in aviation. After my trip, I was reminded that it really is a small world—I’ll wait while you say, “but I wouldn’t want to paint it,” in your best Steven Wright deadpan. Finished? Good. When I arrived at The Sanctuary the next week, to return to the business of writing, the universe, as it’s wont to do, showed off again. A week long figurative painting class taught by the talented Dee Beard Dean unfolded across from me as I worked on my novel. I always welcome company at The Sanctuary as I’m often by myself most of the day. The energy and passion of these painters weaving their own personal masterpieces lifted me as well. In the studio with the painters, I sensed the same energy I’d felt at Oshkosh, an electric pulse in the air. As I wrote, the painters seemed to glow themselves as they turned blank, white canvases into colorful realities, creating beauty from brushstrokes. Occasionally, I walked around, admiring each painting, all similar in scene, but each with subtle, but separate nuances that marked their take on the world they saw before them, ones that differed from their studio neighbor. When I’d return to my chair to write once more, I’d often lift my eyes from the scenes in my novel to peek at the scene before me. If I squinted my eyes just right, I could almost see light swirl off each of them, as if their passions, ignited from within, could have illuminated the room even if we’d flicked the overhead lights off. Another reminder of passions, and how they connect, leapt at me when I opened the avalanche of email once I returned last week. A good writer friend of mine, one who appears on the verge of big things, had sent an email about the Pilots N Paws organization. This friend has a deep love for animals and is an active volunteer for animal shelters and rescue operations, sharing this passion with several other friends of mine. There is a common thread I noticed among these friends as well: excitement and fulfillment in what they are doing. My writer friend knows my flying passion well, knows it’s the subject of my novel. She passed along information that happens to bring together the animal lover groups and the aviation groups. So, if you are a pilot, here’s an opportunity to help another tight community full of good people, ones who do things because they love to, not because someone makes them. As pilots, we know it’s thrilling to spend time in the sky. We’re always looking for excuses to do it. But it’s also fun to have a destination. For the period between September 12th and September 20th, pilots can donate ferry rides to save animals and get them to locales where volunteers can ensure they are safe. Please consider helping out if you can. Click here for more details. My life is richer, and more energized, after spending time around passionate people the last few weeks. What is your passion? Have you found it yet? No shame if the answer is no, as long as you actively seek it. But don’t be surprised if it’s hiding in plain sight. Often we’re too distracted to notice it because we are chasing what others think we should. What in your world draws you toward it? What looks more vibrant, more colorful than its surroundings? What glows for you? Somewhere, in that swirling light, your passion awaits. Thanks to all for the comments. Your thoughts and encouragement are great and I’m glad the posts resonate with you all. so much here and much to say about it. i’ll save the long version for ‘over coffee.’ i am connected tonight with the idea of passion as it demands of us… i just finished jotting a few words about it myself, but what impresses me here is the way you have woven the passion of your life choices into those of others in the last few days. how fortunate for all of you and us! Chris…loved the part about ‘connections.’ Connections give me a little shiver of delight whenever I run across them. Truly passion helps those connection happen..as you said…’draws kindred souls to you.’ Thanks for sharing these most profound thoughts! Was amazed by the small world — RV formation part. Thanks for sharing. Can’t wait for my next opportunity to slip my new word "wont" into conversation….Although, I should practice its usage a bit first because I’m wont to screw up that sorta thing from time to time? Wonderful glimpse into your passionate world . I agree that we ‘glow’ when we are connected to that which brings up to life. Thank you for the reminder. A mutual acquaintance sent me this link to your site today. What an uplifting website with such a positive message! I would like to thank you on behalf of Pilots N Paws for bringing awareness to the wonderful gift volunteer GA pilots are giving these innocent animals every day. According to the pilots, this is likely the most rewarding flight you will ever make! We are also a 501c3 so your flights are considered charitable donations. The Pilots N Paws 5000 is a special event aside from our everday work helping animals get to where they need to go. This event is to bring public awareness to not only the animals and their needs, but to general aviation and how our country needs you! Watching the pilots and volunteers work together towards this common goal is truly amazing……we all know that pilots love to fly, they have a passion for it, and what better reward then making a difference by flying an animal who was slated for euthanasia to another area where they have a greater chance at finding that loving home? We need pilots in the Carolinas and the south in general so if you are ever looking for a different way to combine two passions, we are it! Although I am not a pilot I love planes and am sharing this love with my grandson. Great article on passion! Your words are inspiring – as ever. You’ve always got a reservation at Chez Fumer (the camp in the woods at Oshkosh). We are all richer that you are part of the AirVenture gang. Another thoughtful, thought-provoking article, Chris. Reading it makes me want to walk into a mall or a busy area and see if I can spot the people who are operating out of passion in their lives. I agree – there often is a certain "spark" or aura about them that sets them apart. Once again, you’ve discovered truth as you soared above the clouds. My passion for writing led me to connect with you and read your ramblings, which always inspire my soul to continue on its own quest. Thanks again for your words from above and beyond.